The WAND Taxonomy Editor is used to add and categorize words to the Sentiment Taxonomy. Obtain the WAND Taxonomy Editor software. 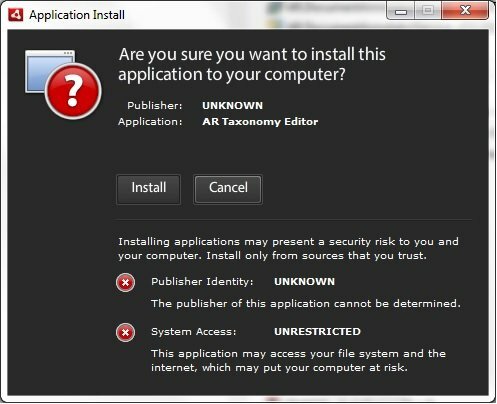 Ensure that Adobe Air is installed on your system. The Application Install dialog box opens, as shown in the following image. 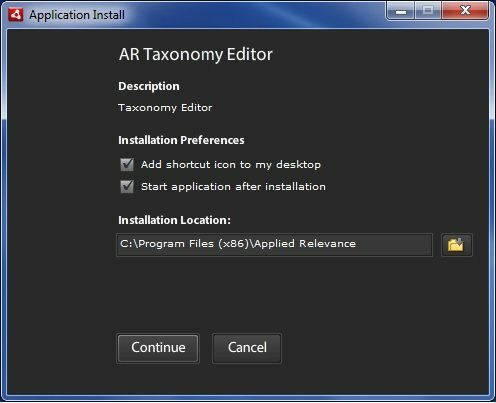 The AR Taxonomy Editor installation pane is displayed, as shown in the following image. During the installation, a progress bar is displayed, as shown in the following image. 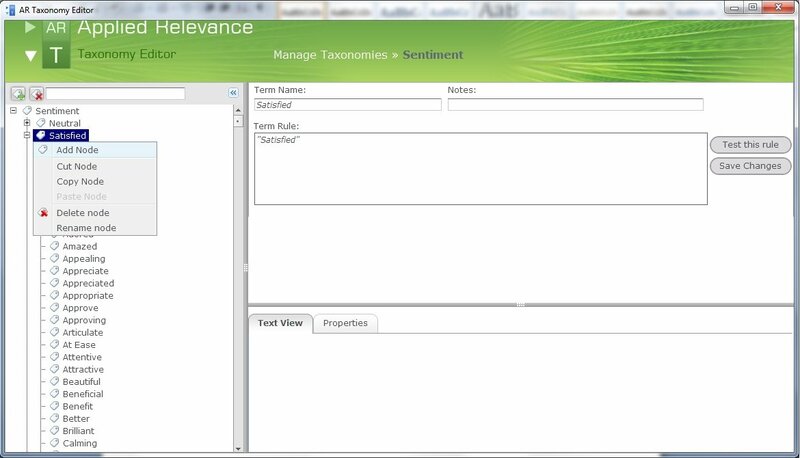 After the installation is complete, the AR Taxonomy Editor is displayed, as shown in the following image. 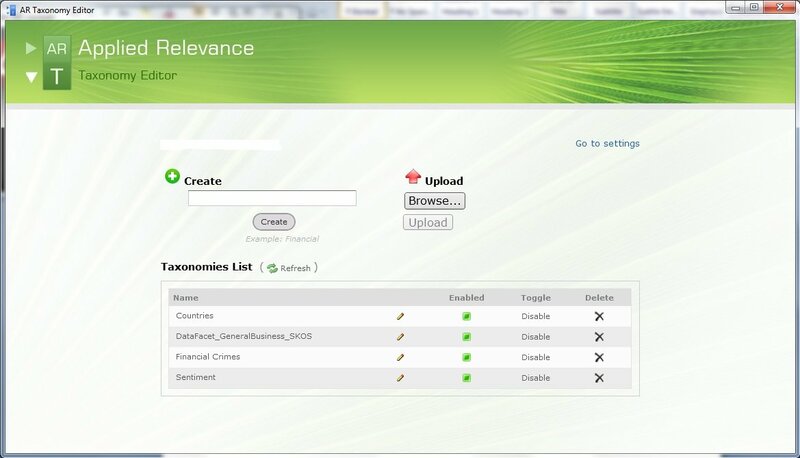 In the AR Taxonomy Editor, click Sentiment from the Taxonomies List, as shown in the following image. 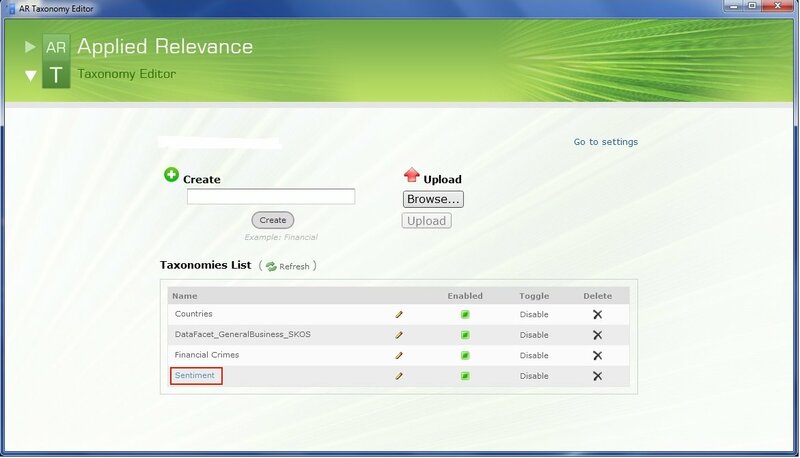 The Sentiment window of the AR Taxonomy Editor is displayed, as shown in the following image. 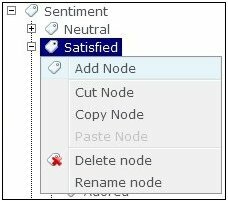 The Sentiment Taxonomy categories include Neutral, Satisfied, Very Satisfied, Very Dissatisfied, and Dissatisfied. To categorize words, a node must be added under the category that will reflect the appropriate scoring. Right-click on a category in the left pane (for example, Satisfied) and click Add Node from the context menu, as shown in the following image. In the new field that is added in the left pane, enter a name for the new node (for example, B plus), as shown in the following image. In the right pane, enter a new term rule for the node in the Term Rule field, as shown in the following image. For example, entering "B+" OR "B plus" will be scored as Satisfied. Click Save Changes to save the new addition to the Sentiment Taxonomy. 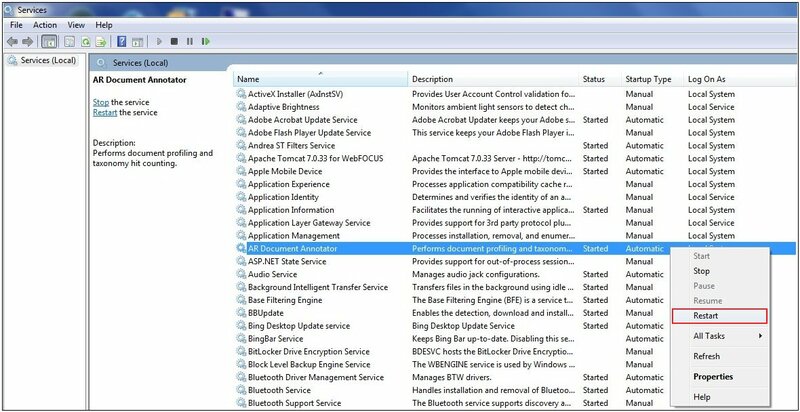 To apply the changes, open the Services utility on Windows through the Control Panel and restart the AR Document Annotator service, as shown in the following image.